Customers with the best experience generate 140% more revenue. Digital transformation enables greater customer engagement, and therefore greater revenue. What is the business value of an improved customer experience? CEOs have never responded well when chief customer officers (CCOs) say “Trust me, this is the right thing to do.” In fact, the average tenure of a CCO is only 27 months (recent CCO Council research). Why is this so low? One reason is that some customer executives struggle to demonstrate quantifiable ROI for customer initiatives. When the CEO and CFO are making priority decisions they simply can’t compare the returns for investing in CX improvements with hiring another salesperson. Or worse, when the company hits a revenue road bump, the CCO’s initiatives and sometimes even the CCO herself are the first to be cut because their value cannot be quantified. 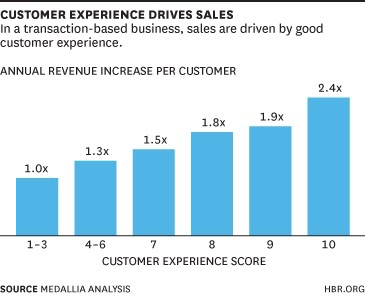 According to research published in HBR by Medallia, customers with the highest CX scores generate 140% more revenue than those with the lowest. 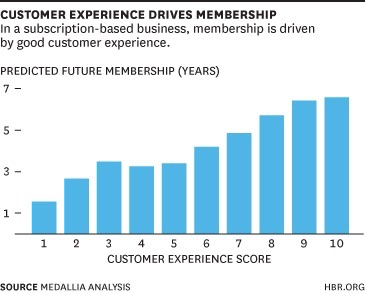 Medallia examined in depth two companies, one transactional and one subscription based. Transactional companies typically measure return frequency and average spend per visit. Subscription-based companies typically measure duration of repeat business, typically through retention, cross-sell, and upsell. They examined customer feedback and experience scores at a point in time, and then actual behavior for the subsequent year. This is important, as one of the downfalls of NPS measurement is that it measures nebulous intent and not actual behavior. After controlling for other factors that drive repeat purchases such as affinity or natural consumption cycles, Medallia found a strong correlation between CX and revenue. Revenue generated by each customer increased significantly with higher CX scores. The customers with the best past experiences generated 140% greater revenue than customers with the worst past experiences. For the subscription business, customers having the poorest experience stood only a 43% chance of being a member a year later, and were only likely to remain a member for a little over a year. Conversely, those with the best experiences were 74% likely to remain a member a year later, and were likely to remain a member for six years. Done right, digital transformation promises improved customer engagement, a better experience doing so, and decreased costs to serve. And that’s a compelling argument. How are you demonstrating the ROI of your customer initiatives and CX programs to your CEO?